OMG! What a brilliant colours!! I love how to use the colours, your vibrant nuances... you are bright like your pencils!!! Gorgeous card, Jane! I love all the colours you've used. I feel like I could hop right into the scene. Stunning Jane, I'm in awe of your colouring skills!! Great card and such a fun image. Your colouring is fabulous. Thanks for sharing with us at Crafty Ribbons in our Christmas challenge. This image makes me smile! 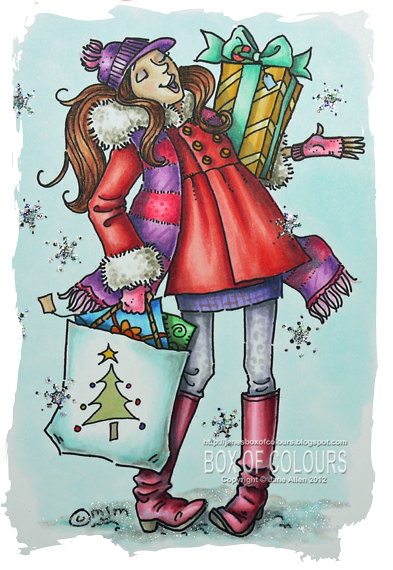 She is simply lost in her shopping adventure - my kind of girl, lol! OMG how do you get those reds to blend. I think "gobsmacked" is the proper adjective here! 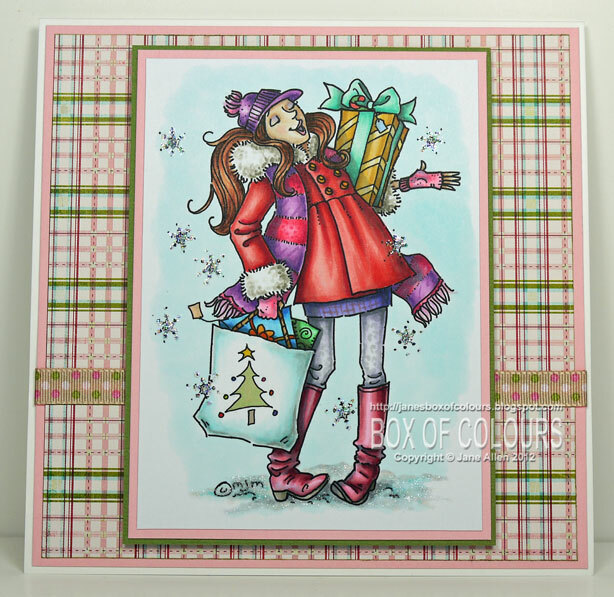 Gorgeous card Jane, your colouring is amazing! Your poetry 'aint bad either!! Gorgeous image and wonderful colouring..
Hi Jane, oh wow beautiful colouring and a stunning image. Great colour choices, so bright and cheerful. PS - My daughter (whose 5) came home from school today and said that they'd been learning about some people I might not know about - Guy Fawkes being one of them! She was quite surprised that I knew who he was!! Fabulous coloring Jane! I always have trouble with white but I really like how you did her cuffs and collar. Awesome Mo image too. :-) Glad to have you playing along with us at Mo's this week! Hugs! Beautiful card. Your coloring is stunning. I had not heard the poem or the reason of the firworks, so your history lesson was very interesting for me. Awesome colouring as always. Maybe I can hire your cute little shopper to do some of my own Christmas shopping. But given that she is 'across the pond' it might be a little far for her to come help me out. Oh well, I guess I'm stuck doing it myself. Thanks for joining us at Mo's challenge with one of your little-big masterpieces! What a gorgeus card you made ​​and I like your color explosion! Fabulous image and gorgeous colouring! :) This looks amazing!